Subject: Transport Allowance at double the normal rates to persons with disabilities employed in Central Government. 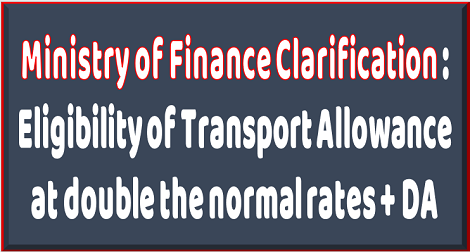 References have been received in this Department seeking clarification whether Transport Allowance at double the normal rate is admissible to persons with disabilities employed in Central Government who have been provided with Government Accommodation within one km. of office or within the campus housing the place of work and residence. 2. The matter has been considered in this Department and it is clarified that persons with disabilities employed in Central Government, as mentioned in Para 2(iii) of OM No. 21/5/2017-E.II(B) dated 07.07.2017 regarding grant of Transport Allowance as per 7th CPC rates, are eligible to draw Transport Allowance at double the normal rates + DA thereon, irrespective of whether they are residing within the campus - housing the place of work and residence or Govt. or private accommodation within one km. of office. 3. All other terms and conditions regulating the Transport Allowance at double the normal rates will remain the same. All Ministries and Departments of the Govt. of India as per standard distribution list. Copy to : C&AG and U.P.S.C. etc. as per standard endorsement list.